For a very long time, rice ball with sesame and salt has no longer been a food of poor lives; it has become an elegant food of the Vietnamese cuisine. I still remember when I was a small kid, my mother used to make the rice ball with sesame and salt for us to bring with everytime we went on a long trip. Now that I grow up, the dish remains my favorite. It can be my breakfast or a light meal in the afternoon. Especially on cold days, its tasty flavor reminds me of my childhood and my family so much. Like many other snacks, rice ball with sesame and salt is also sold on streets, and if you do not quickly buy some, you will not have any left since the peddled wares would be empty very soon. Although the dish is simple, its flavor attracts many customers. The rice ball with a pure white is so eye – catching; it can even make us feel the sweet taste of the rice just by a look. Many people may think that it is very simple to make such a ball of rice like that, but actually, it requires many skills. Making the sesame and salt is quite simple, we only need to dry sesame, peanut and grind them; then mix them with salt. Yet, we should notice not to make the sesame overdone. For the rice ball, it is not that easy. We have to be very skillful to cook a good pot of rice that is also soft and glutinous but not so wet. When the rice is cooked, we have to make the rice ball immediately so that all the seeds would stick together firmly. To do so, we need to be clever since the rice seed must not be broken however firm the rice ball is. After that, use the banana leaves to pack it. 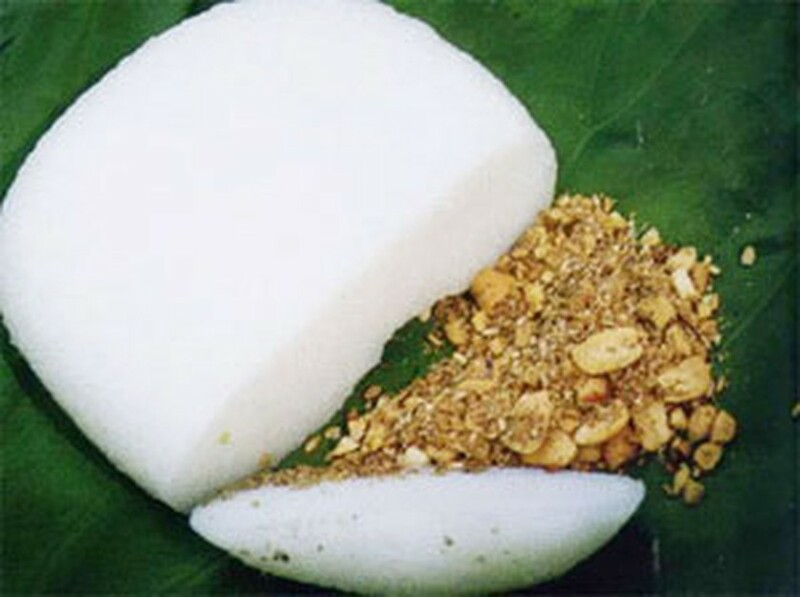 Today, people use nylon bag or newspaper to pack the rice ball, which have make its refined flavor lessen. However, it still strongly attracts many customers. Rice ball with sesame and salt can be served with many other foods; but it would taste best only when it is served with sesame and salt. The white color of the rice, together with the golden yellow of sesame creates such an eye – catching plate. The sweet taste of the rice mixes with the salty and greasy taste of the sesame and salt make the dish so delicious. However simple and rustic the dish is, it will always be special, since the flavor it brings is so unforgettable and it reminds us so much of the old time.